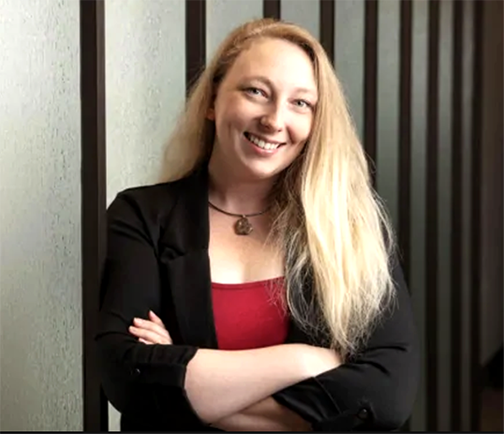 Markie Miller, who received a bachelor of arts degree in anthropology from The University of Toledo in 2012, has been invited by the United Nations to speak before its General Assembly in New York City. On Earth Day, Monday, April 22, Miller will be featured at the Ninth Interactive Dialogue of the General Assembly on Harmony With Nature. 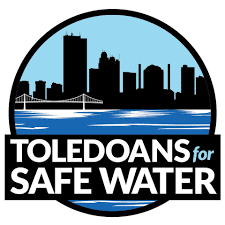 Miller and Crystal Jankowski of Toledoans for Safe Water will travel to the Big Apple for the event. Miller plans to talk about the rights of nature movement, which views nature as an entity that has legal rights. The two women worked for the Lake Erie Charter Initiative passed by Toledo voters in February, recognizing a Lake Erie Bill of Rights. With it, Lake Erie’s right to thrive, exist and flourish is protected in contrast to its treatment as property to be debased for the financial gains of special interests, according to Miller. Miller plans to talk about the rights of nature movement, which views nature as an entity that has legal rights. “I am honored to represent my community and this initiative,” Miller said. “I’m passionate about community rights and rights of nature; to represent those movements on such an international platform is a humbling and rewarding occasion. Lake Erie’s newfound legal status is part of the growing international rights of nature movement that has been adopted by various Indigenous groups, including the Ho-Chunk Nation in Wisconsin, the Ponca Nation in Oklahoma and, most recently, the White Earth Nation in Minnesota regarding protection of their wild rice fields. However, the battle is not over as Lake Erie’s legal status will be challenged by the concentrated animal feeding operations in the Maumee River watershed, according to Miller. Miller, who received a master’s degree in environmental science from the University of Idaho, is on the board of directors for the Ohio Community Rights Network and the National Community Rights Network. When she graduated from UToledo in 2012, Miller was recognized as the Outstanding Anthropology Student, Outstanding Foreign Language Student (German), and Outstanding Graduate of the College of Arts and Letters. 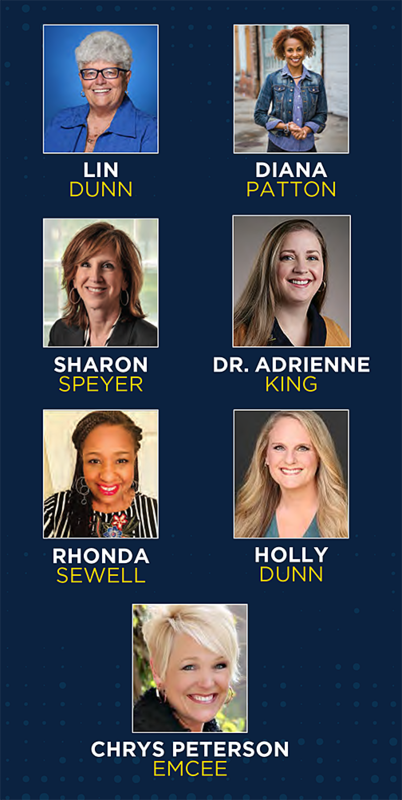 Six UToledo employees were honored for exceptional achievement and dedication to the campus community at the 33rd annual Outstanding Women’s Award ceremony. More than 80 attended the University Women’s Commission program, which was held April 10 in the Savage Arena Joe Grogan Room. Tricia Cullop, who just became the winningest coach in UToledo women’s basketball history with 241 victories, spoke at the luncheon. Receiving the Dr. Alice H. Skeens Outstanding Woman Award were, from left, Angela Roach, Margaret “Peg” Traband, Linda Curtis, Dr. Amy Thompson, Dr. Julie Fischer-Kinney and Amanda Schwartz Clark. • Linda J. Curtis, secretary 2 in the Department of Women’s and Gender Studies. Curtis joined the University as an office assistant at the Catharine S. Eberly Center for Women in 2002. She received a bachelor of arts degree and a certificate of diversity management from the University. • Dr. Julie Fischer-Kinney, assistant provost for student success and retention in the Office of the Provost. She has worked at the University for 20 years, starting as an academic program coordinator in the Chemical Engineering Department. Fischer-Kinney also has served as director of student services in the College of Nursing; director of New Student Orientation Programs; associate dean and interim dean of YouCollege; and director of success coaching. She received a bachelor’s degree in business administration majoring in marketing, and master of education and doctoral degrees in higher education from the University. • Angela Roach, senior associate director of financial aid in the Office of Financial Aid. 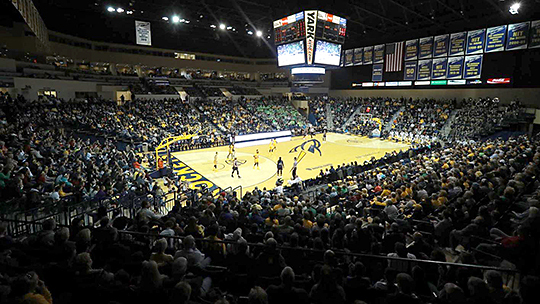 The UToledo graduate began working at her alma mater in 2007. • Amanda Schwartz Clark, associate director of alumni engagement in the Office of Alumni Engagement. She has worked at the University since 2008. • Dr. Amy Thompson, vice provost for faculty affairs, professor of public health, and co-director of the Center for Health and Successful Living. She joined the faculty in 2008 and has served as president of Faculty Senate. A University graduate, Thompson received a doctorate in health education and master of science and education degree in public health. • Margaret F. “Peg” Traband, who retired as senior vice provost of academic affairs in 2018. She began her career at UToledo as an instructor in the Respiratory Care Program in 1975 at the former University Community and Technical College. The UToledo alumna served the Respiratory Care Program as director of clinical education and program director. She was promoted to professor in 1991. Traband also was an associate dean and interim dean of the College of Health Science and Human Service (now Health and Human Services) prior to joining the Office of the Provost in 2008. The University Women’s Commission also presented $1,000 scholarships to four students. Receiving awards based on academic achievement, support of women’s and gender issues, and campus involvement were Diala Abou-Dahech, a senior majoring in recreational therapy; Laura Heckenmueller, a senior majoring in pharmaceutical sciences; Elizabeth Konopka, a senior majoring in history; and Rose Mansel-Pleydell, a senior majoring in art. 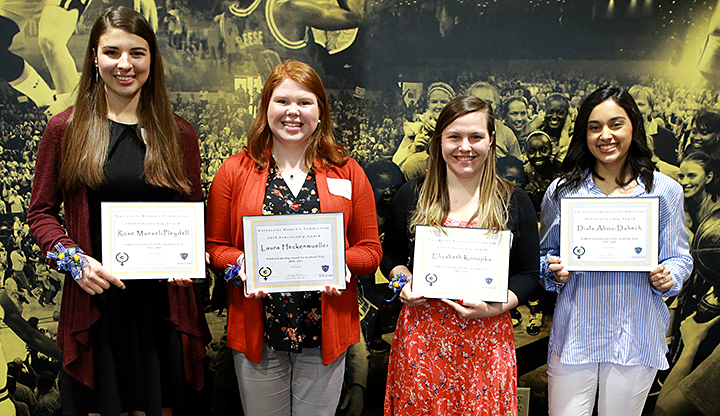 Four seniors received scholarships from the University Women’s Commission. They are, from left, Rose Mansel-Pleydell, Laura Heckenmueller, Elizabeth Konopka and Diala Abou-Dahech. The University of Toledo College of Business and Innovation and the Business Engagement and Leadership Council will hold its 56th annual Pacemaker Awards Friday, April 12, at the Inverness Club. Ramon E. Gonzalez III will receive the 2019 Business Pacemaker Award at the ceremony, which will start at 7 p.m. He received a bachelor of business administration degree from the University in 1961. Gonzalez split his career between serving as a foreign service officer at the U.S. State Department, as assistant vice president at Merrill Lynch, and as chief financial officer of Lone Star Seed Co. in San Antonio. He is now retired. Gonzalez served in the military and is a retired captain of the United States Army Reserve. 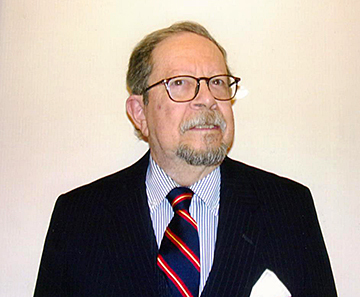 He also is a past member of the staff of the U.S. House of Representatives, and a member emeritus and past secretary of the Explorers Club, Washington Group. The University alumnus is a strong supporter of the College of Business and Innovation’s Edward H. Schmidt School of Professional Sales. Gonzalez and his family regularly visit the University every fall. Student Pacemaker Awards are presented to College of Business and Innovation graduate and undergraduate students for their outstanding academic achievement, University and community service, and leadership. • Dean’s Award — Abigail Brannan. 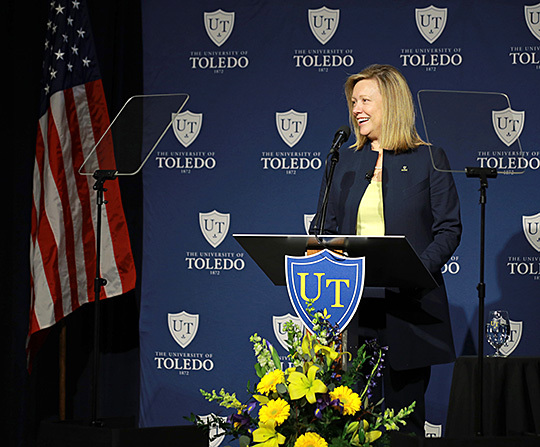 In her third State of the University address, President Sharon L. Gaber focused on the important contributions of students, faculty, staff, alumni and supporters in positioning UToledo for the future. 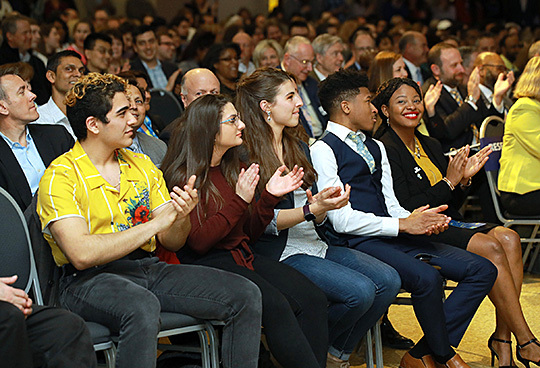 “Above all else, today is a celebration of the people who showcase the exciting future for our great institution,” Gaber said to the audience of more than 500 gathered April 3 in the Thompson Student Union Auditorium. President Sharon L. Gaber delivered her third State of the University address April 3 in Thompson Student Union Auditorium. The president unveiled UToledo’s new brand, Fueling Tomorrows, in her address that concentrated on how through the dedication and commitment of UToledo’s faculty, staff and students, the institution is achieving its strategic priorities — specifically in the areas of student success, groundbreaking research, and progress in growing its national reputation. 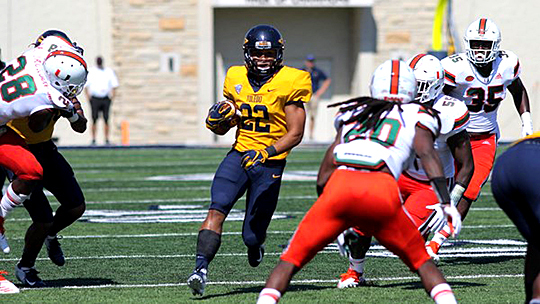 Through the individual stories of students, researchers and alumni, Gaber illustrated how UToledo is making an impact. The determination and resilience of Lovely Forges and Justin Tapp, both graduating in May, led highlights of the personal experiences of students. Young alumni also were featured, including Quinton Babcock — now mayor of the Village of Oak Harbor, Ohio — and Margaret Gorz, an associate scientist for Estée Lauder in New York. Students applauded when President Sharon L. Gaber announced that kayaks will be available on the Ottawa River this fall. Gaber announced several key support programs and coming additions to campus, including a meal alert program, kayaks on the Ottawa River starting in the fall, and a new soccer field coming to Main Campus outside the Fetterman Training Center, to underscore how UToledo continues to reimagine its various services and facilities to be supportive and responsive to student success. “We are on a mission to help students succeed, but we realize that the word ‘success’ can translate in different ways for a student body as rich and diverse as ours,” Gaber said. Rocket student-athletes were recognized for proving their excellence in the classroom as well as in competition. Seven sports programs led the Mid-American Conference in Academic Progress Rate, and Coach Tricia Cullop recently became the winningest women’s basketball head coach in the program’s history with 241 career victories. 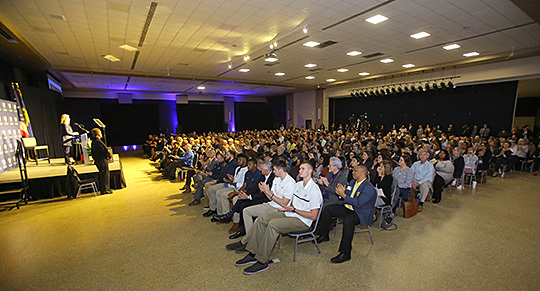 More than 500 attended President Sharon L. Gaber’s third annual State of the University address in the Thompson Student Union Auditorium. The president also applauded the University’s rigorous approach to research, innovation and outreach, which has contributed to its growing national profile. Gaber announced that cutting-edge physicist Dr. Yanfa Yan will collaborate with the National Renewable Energy Laboratory to develop ultra-high efficiency solar cells, thanks to a $1.1 million grant from the U.S. Department of Energy. The University also will host a National Lab Day this October, which will connect its researchers and students with Department of Energy scientists, facilities and opportunities that are unique to some of the country’s most preeminent labs. The president also highlighted a number of recent achievements to celebrate. In addition to record highs in academic preparedness for first-year students and six-year graduation rates, graduate programs in nursing and law have risen dramatically in U.S. News & World Report rankings. 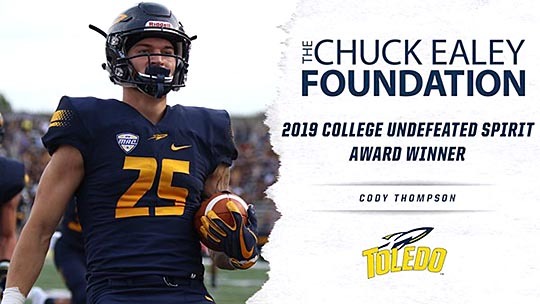 Gaber encouraged everyone present, and those in the wider Toledo community, to proudly tell UToledo’s story to share the positive energy that positions the institution for continued success. “At The University of Toledo, we are a community inspired to help our students succeed through inclusive collaboration, scholarly research and hands-on experience,” she said. Watch the full address on YouTube. 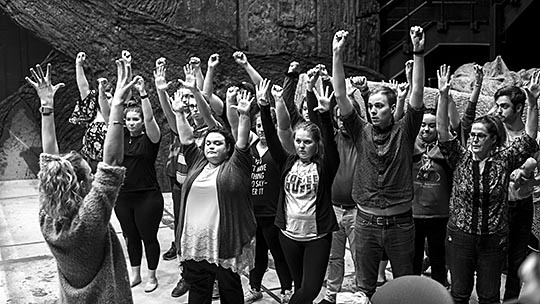 The University of Toledo Department of Theatre and Film will present the musical “Into the Woods,” which will open this weekend. The production will be held Friday through Sunday, April 5-7 and 12-14, and Friday and Saturday, April 19 and 20, in the Center for Performing Arts Center Theatre. Friday and Saturday performances will be at 7:30 p.m., and Sunday shows will be at 2 p.m. On Saturday, April 6, there also will be a 2 p.m. performance. And on Saturday, April 20, the final day of the run, there will be a performance only at 2 p.m. The music and lyrics for “Into the Woods” are by Stephen Sondheim with a book by James Lapine. The University production will be directed by Dr. Edmund Lingan, professor and chair of theatre and film. Musical direction is by University alumnus Nathanael Leonard, and choreography is by Abby Glanville, academic advisor. Included in the cast is Pam Tomassetti Hulbert (playing Jack’s Mother), who acted in the original developmental version of “Into the Woods” when it was being created by Sondheim and Lapine. She is a member of the Actors’ Equity Association and assistant speech coach at Perrysburg High School. Four characters, drawn from fairy tale legends, are given the chance to make their dearest wishes come true. The characters find themselves on quests that are woven together. Originally released in 1986, the musical won several Tony Awards, including Best Score, Best Book and Best Actress in a Musical (Joanna Gleason) when it was presented on Broadway in 1987. The 2014 Disney film version was nominated for several Academy Awards and Golden Globes. Fans of the musical are encouraged to come to the performance dressed as their favorite fairy tale characters. A background of the forest will be available in the lobby where fans can take selfies to post on Facebook. The selfies with the most likes will win prizes. There is no cost to enter; a ticket purchase is not required to participate in the selfie contest. 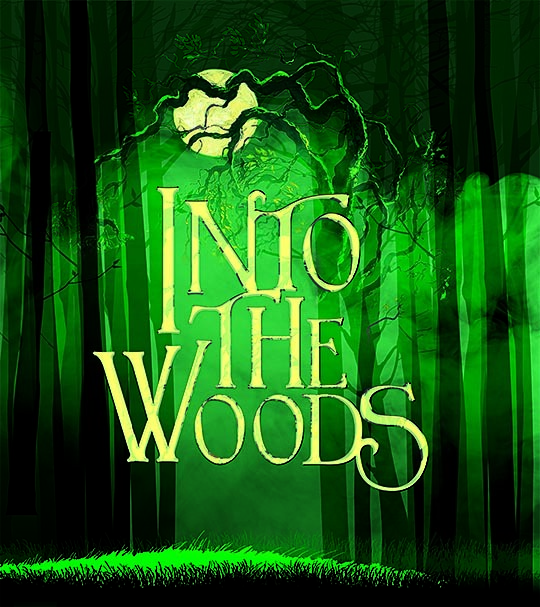 “Into the Woods” is presented through special arrangement with Music Theatre International. All authorized performance materials are supplied by the theatrical licensing agency. Choreographer Abby Glanville rehearsed with the cast, including front row from left, Paige Chapman, Chelsie Cree, Ashley Roark, William Floss and Pamela Tomassetti. The cast features Jadin Bader, sophomore majoring in nursing, as Giant/Granny; Jordan Benavente, community member, as Wolf; Paige Chapman, junior majoring in voice, as Rapunzel; Chelsie Cree, University alumna, as the Baker’s Wife; Caris Croy, junior majoring in music and theatre, as Cinderella’s Mother; Emily Damschroder, freshman majoring in theatre, as Lucinda; Kurt Elfering, junior majoring in religious studies, as the Baker; Will Floss, University alumnus, as Jack; Gabriel Hagedorn, freshman majoring in piano, as Cinderella’s Prince; Jackson Howard, student at Owens Community College, as Steward; Sarah Hunter, community member, as Little Red Riding Hood; Jack Kerger, Toledo School for the Arts alumnus, as Cinderella’s Father; Andrew R. Kleopfer, junior majoring in theatre, as Rapunzel’s Prince; Jennifer Nagy Lake, University alumna, as the Witch; Austin Rambo, senior majoring in theatre and media communication, as Narrator/Mysterious Man; Ashley Roark, senior majoring in vocal music education, as Cinderella; Paige Titsworth, freshman, as Florinda; and Kate Walcher, senior majoring in vocal performance, as Cinderella’s Stepmother. Members of the design team include Daniel Thobias, associate professor of theatre, scenic designer; Katelyn Justice, sophomore majoring in theatre, assistant scenic designer; Kelly McBane, manager of the University Costume Shop, costume designer; Logan Fleming, sophomore majoring in theatre, assistant costume designer/hair and makeup designer; Faith Murphy, junior majoring in theatre, assistant costume designer; Frankie Teuber, University alumna, props master; Faith Pegus, junior majoring in visual arts with a minor in technical theatre, assistant props manager; Stephen Sakowski, assistant professor of theatre, lighting designer; Elise Pahl, sophomore majoring in theatre, assistant lighting designer; Amanda Were, community member, sound designer; Ryan Peters-Hieber, senior majoring in theatre with a concentration in design technology, associate sound designer; Sarah Potter, senior majoring in film/video with a minor in English, production videographer; Addison Toth, freshman majoring in theatre, stage manager; Morgan Cunningham, freshman majoring in theatre, and Emily Wemple, senior majoring in theatre, assistant stage managers; and Bryan Harkins, senior majoring in theatre, assistant production manager/house manager. Tickets are $15 for students; $20 for University faculty, staff and alumni, and military members and seniors; and $25 for the general public. Call 419.530.ARTS (2787) or go to the School of Visual and Performing Arts’ website. Tickets also will be available at the door. The craft brewery boom is good for home values. Using Charlotte, N.C., as a case study, researchers at The University of Toledo and the University of North Carolina at Charlotte found that craft breweries have a positive impact on residential property values. Condominiums in center-city neighborhoods show a nearly 3 percent increase on sales price after a brewery opened within a half mile. Single family homes in center-city neighborhoods saw a nearly 10 percent increase after a brewery opened within a half mile. The study, which is published in Growth and Change: A Journal of Urban and Regional Policy, found no significant impacts on commercial property values. In Charlotte, a relatively large and growing city with an increasing competition for land and housing, 21 breweries opened between March 2009 and October 2016. For the study, researchers focused on properties sold between 2002 and 2017 within a half mile buffer of a brewery and found that while many areas in close proximity to a craft brewery appear to have been associated with relatively higher price premiums even before the opening of the brewery, breweries tend to add to this premium. “These results are informative to policymakers considering revising zoning laws and other regulations in efforts to promote the growth of craft breweries and spur economic development in their local economies,” said Dr. Isabelle Nilsson, assistant professor in the Department of Geography and Earth Sciences at the University of North Carolina at Charlotte. 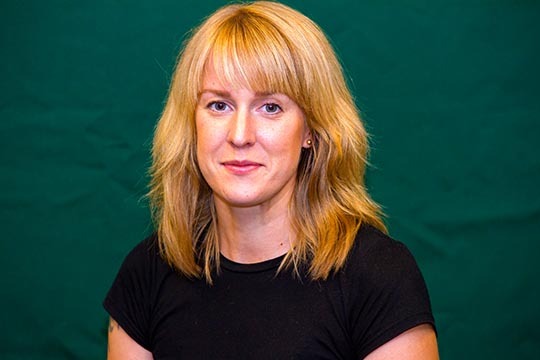 Nilsson earned a Ph.D. in spatially integrated social science at UToledo in 2015 and her master’s in economics at UToledo in 2011. 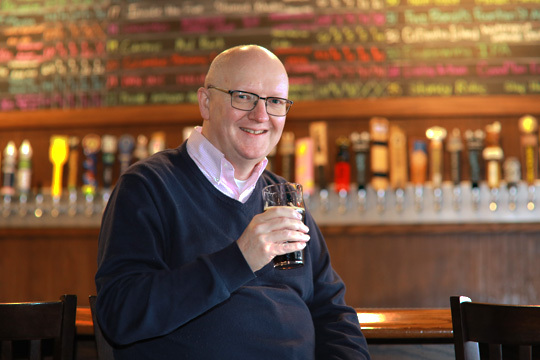 Reid’s previous research has shown that craft breweries often tend to be located in neighborhoods that have recently experienced economic distress, and craft breweries have played a key part in revitalization efforts in many urban areas by restoring old, abandoned buildings. Craft breweries contributed $76.2 billion in economic impacts to the U.S. economy in 2017, including more than 500,000 total jobs with more than 135,000 jobs directly at breweries or brewpubs, according to the Brewers Association. In a separate study recently published in Papers in Regional Science, the researchers took a close look at craft brewery closures in Chicago, Denver and Portland from 2012 through 2016 after a decade of rapid industry growth. In those four years, 27 craft breweries closed and 225 opened for business. Peak growth in all three cities took place in 2013 and 2014, and since then the number of entries into the market have declined while the number of closures has increased. The economic geographers found that being in a cluster does not have a significant effect on brewery survival. Although closures do not appear to occur in brewery districts or in areas with a high concentration of breweries, closures tend to occur in more residential areas outside of downtowns. Closed breweries had an average of one other brewery within one mile, while those that were still open as of 2016 had around 2.5 other breweries surrounding them. • Being in a neighborhood where incomes are higher is positively related to brewery survival. • As the population of white and millennials in a neighborhood increases, the probability of a brewery surviving decreases. • Higher population density also is associated with greater likelihood of closure. “Even though millennials are driving the industry and craft beer drinkers are predominantly white, income is more important than racial composition or age composition,” Reid said. Dr. Oleg Smirnov, associate professor of economics at UToledo, and UToledo doctoral student Matt Lehnert, also served as co-authors on the study of closures in the craft brewing industry. To learn more about the evolving appetite of craft beer drinkers and the experimentation of craft brewers, check out Reid’s blog about the beer industry.